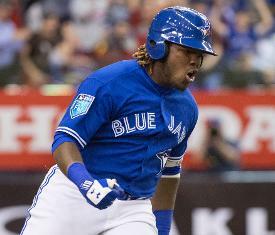 Toronto Blue Jays top prospect Vladimir Guerrero Jr. will be sidelined at least four weeks with a strained patellar tendon in his left knee, the team revealed Sunday. The 19-year-old Guerrero, who is playing for Double-A New Hampshire, left Wednesday's game against Akron after hitting a single in the fourth inning. He was limping off the field and favoring the leg after being replaced by a pinch runner. Guerrero, who plays third base, was batting a torrid .407 with 11 homers, 55 RBIs and 20 doubles in 53 games. The son of upcoming Hall of Fame inductee Vladimir Guerrero is considered the No. 2 overall prospect in baseball behind Ronald Acuna Jr. of the Atlanta Braves. The younger Guerrero appeared in line for a promotion to Triple-A Buffalo prior to the injury with an opportunity to jump directly to the majors also a possibility. It isn't known how the injury setback will affect Toronto's intentions. The Blue Jays did make a move Sunday, optioning left-handed pitcher Tim Mayza to Triple-A Buffalo to make room for right-hander Preston Guilmet, who was claimed from St. Louis on waivers. Mayza, who pitched two scoreless innings against the Baltimore Orioles before the demotion was announced, was 1-0 with a 2.70 ERA in 10 games this season. He allowed 10 hits and struck out eight in 10 innings. Guilmet, 30, was 0-1 with a 22.50 ERA in two innings for the Cardinals. This is his second stint with the Toronto organization, as he previously pitched for the Jays' Triple-A affiliate in 2015.